AN IRISH MAN has spent the past two-and-a-half years travelling around the world. What’s unusual about that, you ask? Niall Doherty told TheJournal.ie: ”I wanted to do a big trip around the world as I thought it would be a good experience for me. Taking no flights made it more interesting and challenging and a bit more of an adventure. 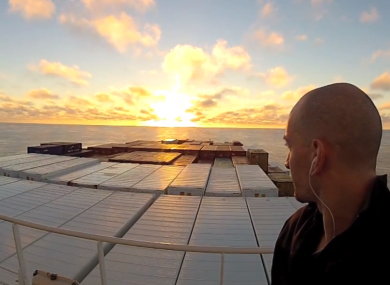 The 32-year-old crossed the Pacific Ocean in a cargo ship and he has the video footage to prove it. He boarded the vessel in Japan and travelled almost 10,000 kilometres in 26 days to make it to Lima, Peru. The CMA CGM La Traviata cargo ship had a 2,000 tonne engine and was carrying 8,500 containers with a deck the size of two football fields. There were 33 crew on board and one passenger – Niall. Having no internet on the ship and being offline like that was really nice. To just disconnect and have time to think and reflect. Best of all were the sunrises and sunsets. It was the most spectacular sky I’d ever seen. Doherty added: “I was alone in the ship during the day but I wasn’t bored because I kept myself busy. I was reading and writing and studying and of course shooting the video. I never got permission to shoot so that was added fun trying to get it done without any of the crew seeing me. Beware, this video includes quite a lot of dancing, which Doherty said made shooting it pretty fun. Doherty has written a book, The Cargo Ship Diaries, about his experiences. Email “Around the world: 30 months. 25 countries. 0 flights ”. Feedback on “Around the world: 30 months. 25 countries. 0 flights ”.